Read more about angular routing and navigation, here. 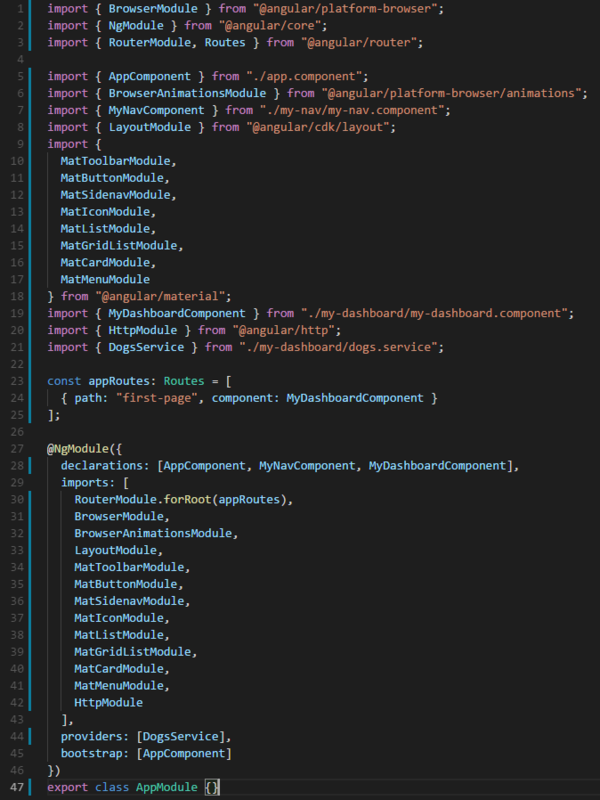 Make sure you read the docs and fully understand how routing works in Angular, it’s one of the most important topics when developing this kind of applications. Let’s change Link 1 to First Page in the navbar. Whenever the link is clicked, it should take us to the dashboard page, therefore, the dashboard page should not be visible by default. 1. Add the route to /src/app/app.module.ts. In /src/app/app.module.ts add the code below, above the @NgModule. Import MyDashboardComponent. This is linking the dashboard component to this link: ‘/first-page‘ . From now on, when you navigate to the home page, http://localhost:4200/ in this case, it will not display the dashboard. When the first link is clicked (First Page) this will take us to the dashboard, or make it visible in our example. Check this works in the web browser. No dashboard on home page. Since we have already opened this file, we can change the name of the project to be upper case. Replace the text from line 16 (random-dogs) with Random Dogs. Save the file. From line 13, remove the code below from the button element. This will enable the navbar to have the toggle button all the time. The user being able to hide or show the menu. If you check your page in the browser now, the name of the project should be uppercase and the dashboard content shouldn’t scroll over the nav bar. Also, if you click the toggle button next to the name of the project, the menu will hide or show up. 2. Show dogs as posts. 2.1 Let’s create a service that will call the DOG API and give us back the data. Learn more about Angular Services. The command above just generated two new files in /src/app/my-dashboard. 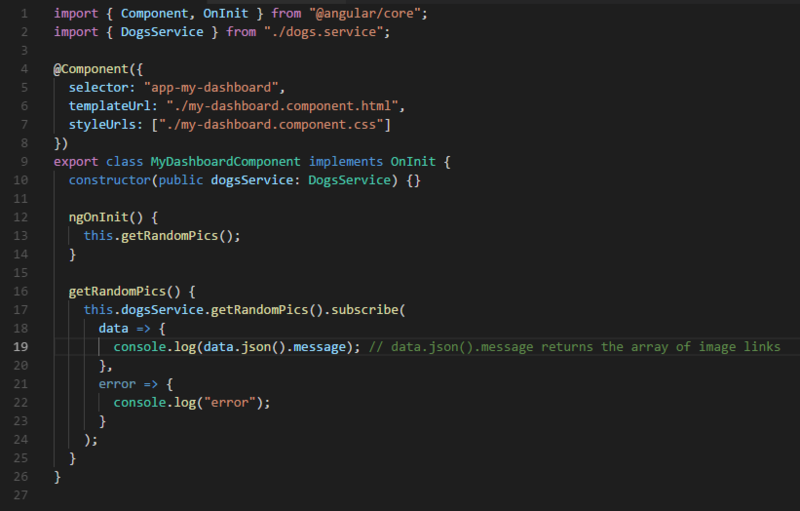 Open dogs.service.ts and create a function that will call the DOG API and get the data back. Copy the code below and paste it under the constructor. You can open this link (https://dog.ceo/api/breeds/image/random/5) in your browser, to see how the output will look like. The code above is the function that calls the API and returns back the data. Add HttpModule to your imports. Add DogsService to your providers. 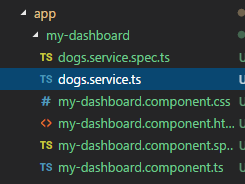 Initiate DogsService in the constructor. ngOnInit function should call getRandomPics function every time the page loads. Create getRandomPics function and console log the output. If you see the output above its great news. Your application has just called the DOGS API and you get the data back correctly. It is time to populate the cards. 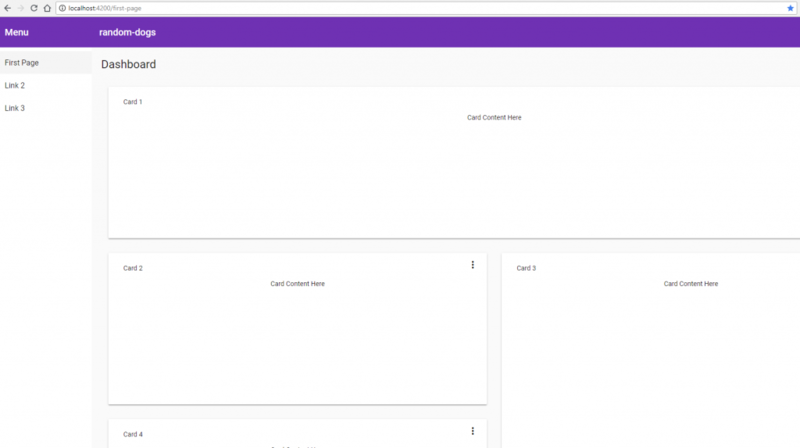 Next, in part 3 we will look into populating the cards with real data from the API.